Next Monday evening, January 3 at 6:00 pm , Billie Stone Fogarty will present information about the genealogical records from the war of 1812, sometimes called the “forgotten war.” The presentation is free and open to the public, in the Chesapeake room of the Oklahoma History Center. As we near the 200th anniversary of this war, more attention is being focused on the event. This conflict between the United States and Great Britain lasted from 1812 to 1815. The British Army occupied Washington, D.C. and set fire to many public buildings. Facilities of the U.S. government, including the White House and U.S. Capitol, were largely destroyed. This is the only time since the Revolutionary War a foreign power captured and occupied the United States capitol. The main land fighting of the war occurred along the Canadian border, in the Chesapeake Bay region, and along the Gulf of Mexico; extensive action also took place at sea. "This Second War for Independence involved one of every 14 men in the United States, gave us our national anthem, and secured the position of the United States in world affairs, Fogarty said. "As the bicentennial of this conflict nears, find out what records exist to help you learn how your family may have been involved." Perhaps the most genealogically rich records for this war are the pension application files found at the National Archives and Records Administration. "There are two primary sets of pension application files relating to veterans of this War," Fogarty said. "The first set consists of pensions based on service resulting in death or disability." She said the second set includes pensions based on length of service, mostly militia veterans called to federal service. 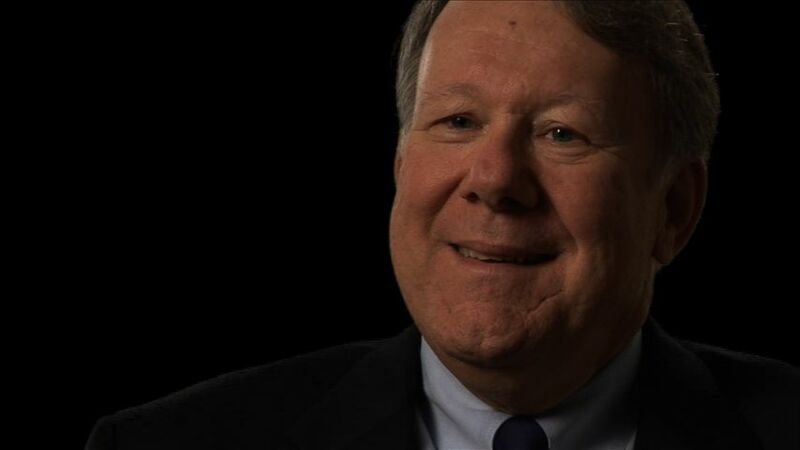 The Federation of Genealogical Societies, a non-profit genealogical organization headquartered in Austin, Texas, is heading up a national fund-raising initiative to raise $3.7 million to digitize of the War of 1812 pension files. The digitization process will enable online access by historians and family researchers to the memories and biographies of those who fought to protect our nation’s independence. As a former history teacher with both Bachelor’s and Master’s Degrees, Ms Fogarty now devotes her time to infecting others with her love for history up close and personal – family history! She lectures regularly and also teaches genealogy each semester in adult continuing education courses. Billie Stone Fogarty serves on the Board of Directors for several genealogical and historical organizations including the Oklahoma Historical Society and Association of Professional Genealogists. She is an active member of the International Society of Family History Writers and Editors and has spoken at National Genealogical Society conferences. She is the author of "Guidebook to Researching My Family Tree.," and was president of Oklahoma Genealogical Society (OGS) for seven years, currently serving as president of Genealogical Speakers Guild. , at six p.m. For more info on OGS, refer to www.okgensoc.org. Help is available before the meeting for those with genealogical questions or wishing to join OGS. The Research Library in the history center will remain open until 7:45 p.m. that evening. NOTE: Does your Organization belong to NGS? If so, we are happy to publish your meeting notices and other news in the Upfront With NGS blog. Please send such posts to [email protected]. Prologue is a magazine that has been published four times a year by NARA since 1969. It has been found that this is not enough opportunity for the National Archives to share the billions of “pieces of history” it holds. Because of that, since April there has been a blog, Prologue: Pieces of History. It caught my eye recently with a post titled “A hot dog for the King” (which I learned about from a Facebook post). This blog entry talks about the visit of King George VI, in June 1939, to Hyde Park NY where he experienced an American-style picnic. This blog entry then links to a more detailed account (and photos) of the visit on the Franklin D. Roosevelt Presidential Library and Museum site. It was easy and fun to follow the link from the initial post to a slightly more detailed one and then another link to an even more indepth version. “As the National Archives’ flagship publication, Prologue brings you the latest “discoveries” from the vast holdings of the Archives—more than 10 billion pages of records, miles and miles of tape and film, and a growing number of electronic records. Select articles from each edition are available on the web-site for you to read. You will need to subscribe to the print ($24) or digital (see below) versions to enjoy the full contents. Addtionally, the website has an archive of the table of contents of past issues (1997 to present) and selected articles (1975 to 2010). Because so many great articles have been published about the various records groups and document types held by NARA, just about anytime I come across a type of Federal document “new to me,” I will find one or more Prologue articles which will provide context for my research. And, I have learned that not only does Prologue have a website presence, Facebook presence and a blog, it can also be found on Scribd and Zinio. You will find a bit more of the content available for download on Scribd (though not the entire publication) or you can subscribe to a digitial version via Zinio (1 year for $19.99) or purchase digital copies of older issues (all issues produced in 2010 are available for $5.99). 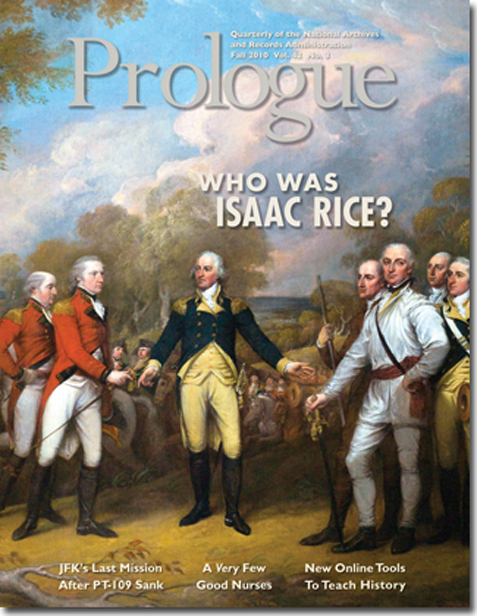 With all of these ways to access the content of Prologue, there is no longer an excuse to miss out on this great NARA publication. Hitler’s Shadow: Nazi War Criminals, U.S. Intelligence and the Cold WarWashington, DC…The National Archives has released to Congress a new report on Nazi War Crimes: Hitler’s Shadow: Nazi War Criminals, U.S. Intelligence, and the Cold War . The report is based on findings from newly-declassified decades-old Army and CIA records released under the Nazi War Crimes Disclosure Act of 1998 (the Act), these records were processed and reviewed by the National Archives-led Nazi War Crimes and Japanese Imperial Government Records Interagency Working Group (IWG), and written by IWG historians Richard Breitman and Norman J.W. Goda. The report highlights materials opened under the Act, in addition to records that were previously opened but had not been mined by historians and researchers, including records from the Office of Strategic Services (a CIA predecessor), dossiers of the Army Staff’s Intelligence Records of the Investigative Records Repository (IRR), State Department records, and files of the Navy Judge Advocate General. 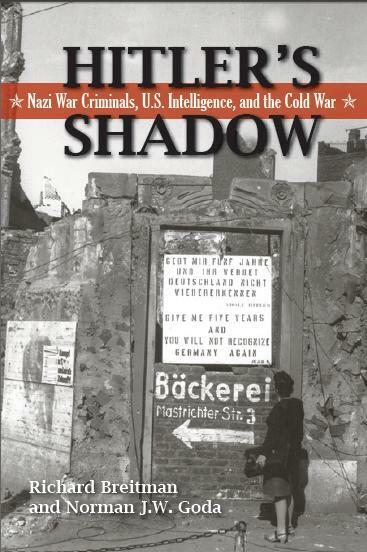 Hitler’s Shadow augments the IWG’s 2005 final report to Congress, U.S. Intelligence and the Nazis, and includes wartime and postwar US intelligence documents on the search for and prosecution of Nazi war criminals; Allied protection or use of Nazi war criminals; and the postwar activities of war criminals both in the United States and abroad. Everyone at NGS wishes you a wonderful holiday season and a safe, healthy, happy and prosperous 2011! 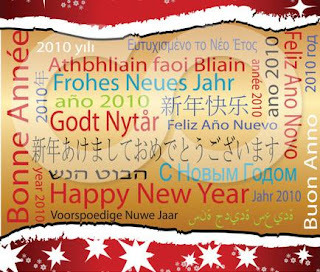 Since we often deal with documents written in other languages, here are some Happy Holiday and Happy New Year wishes in languages other than English. Do you know how to say Happy Holidays or Happy New Year in other languages? If so, please post a comment! 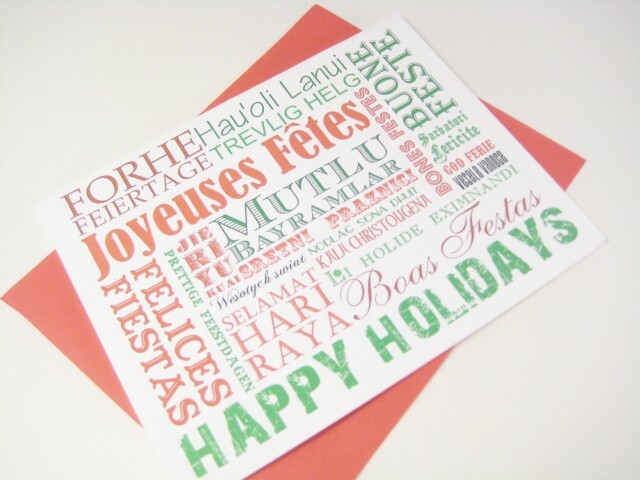 It's fun to know how to share the spirit of the holidays in the languages of all those with whom we share the planet. Though the formal initiative is being launched in the UK, I think it's a "brilliant" idea for those of us living on this side of the pond also. Spending time with family during the holiday period can be a great opportunity to start building your family tree. Or for those who’ve already started their family tree, work on filling in gaps and do listen closely to those family stories. Not only are they interesting to hear, but they often contain details that you can verify through research. With a bit of tweaking to some of the proffered suggestions (e.g., substitute 1910 and 1900 censuses for 1911 and 1901 censuses, etc. ), these are a great way to get started on your family tree or maybe fill in a few gaps. Several UK websites are participating and they each offer up daily tips, recommendations, and suggestions for how you might discover more about your ancestors in fun and exciting ways. And, each website offers its own unique suggestions. So, do sample a few of them in the course of the week. Whether you have UK ancestry or not, these “bite-size activities for each day and helpful guides and charts to fill in” [per FindMyPast.co.uk] are a fun way to capitalize on family gatherings over the holidays and may even prevent some of those colorful family squabbles that have marked past holiday gatherings. Here is the full UK news release. 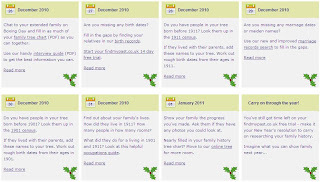 The 26th December 2010 will see the launch of the UK's first ever family history awareness campaign, Start Your Family Tree Week, at a time when family is at the forefront of the nation's minds. Taking part in Start Your Family Tree Week are www.findmypast.co.uk, www.GenesReunited.co.uk, www.scotlandspeople.gov.uk, Eneclann, the Society of Genealogists, My History, BBC Who Do You Think You Are Magazine, Your Family Tree and Family Tree magazine and the week is supported by the Federation of Family History Societies and the UK's digital champion Martha Lane Fox. Although the popularity of family history has grown dramatically in the UK over the past decade, with 42% of the population now saying they have started researching their ancestors, one in three people say they would like to start delving into their family's past but have no idea where to begin*. Start Your Family Tree Week has been launched to encourage people to discover more about their ancestors in a fun and exciting way. The week, which will run until the 1st January 2011, will show people how to take their first steps in family history research with free guides and charts to download, competitions, special offers on participating websites and daily family history activities for all the family. 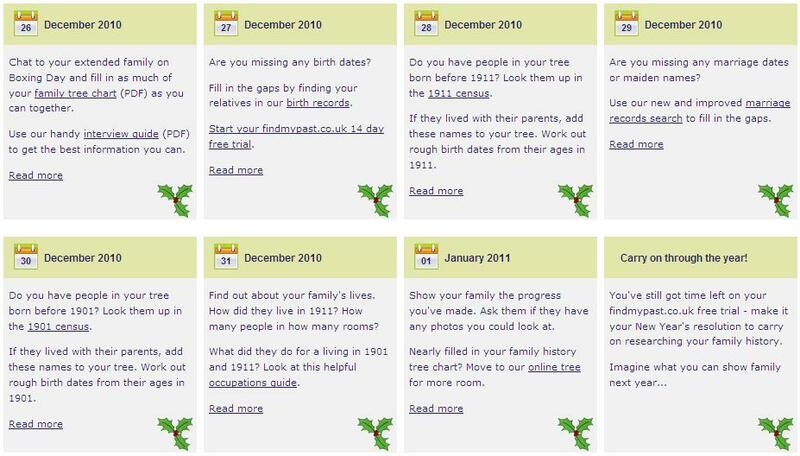 Debra Chatfield, Marketing Manager at findmypast.co.uk, said: "Start Your Family Tree Week will help people make the most of Christmas family gatherings to pass on their family memories across the generations, and to share in brand new discoveries by using online family history resources. The Internet has made it so much easier to trace your family tree and learn about your family's own unique story, full of colourful, real-life characters from the past. Every family has its intrigues, well-kept secrets, and heart-warming tales, and I believe we could soon see family history becoming the traditional Christmas pastime for all the family." Rhoda Breakell, head of Genes Reunited, comments: "Grannies sinking sherries, dads taking an afternoon nap, and siblings squabbling is a typical Christmas Day for most, but it makes you wonder whether your family has always been like that. With this year's yuletide festivities just around the corner it's a great time for you to think about your family's roots. Start Your Family Tree Week is an ideal time to start exploring your family history, whether it's tracing great-grandparents' names, searching military records, or even discovering that you have a famous sportsperson in your gene pool, the resources and offers available from 26th December will make it an easy and fun journey." Martha Lane Fox, UK Digital Champion comments: "I think findmypast.co.uk's'Go ON: Start Your Family Tree Week' is a great idea. Whilst the internet has become a gateway to the future for many it is also an amazingly powerful tool for uncovering the past and reconnecting people in ways that were once unimaginable. Christmas is the perfect time for families to explore their history and encourage older relatives to go online for the first time - I hope that this initiative is a great success and urge everyone to get involved." 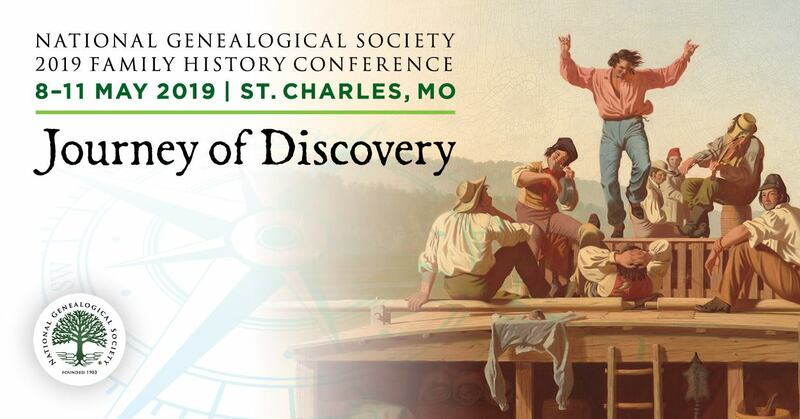 Else Churchill, Genealogist at The Society of Genealogists added: "The Society of Genealogists has been helping people discover their roots for 100 years. Hence we are delighted to support Start Your Family History Week and introduce as many as we can to the fascinations of genealogy." 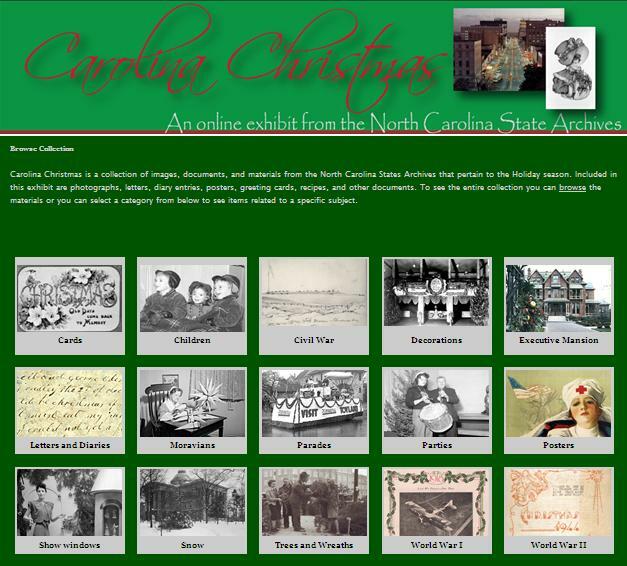 In the past, the North Carolina State Archives has had a physical exhibit in its Search Room called "A Carolina Christmas." They have now created an expanded virtual exhibit. “Carolina Christmas” is a collection of images, documents, and materials from the North Carolina State Archives that pertain to the holiday season. Included in this exhibit are photographs, letters, diary entries, posters, greeting cards, recipes, and other documents. It is so much fun to trawl through the images and documents of Christmases past and enjoy the variety of ways in which the holiday was celebrated. Do you know of other online Christmas-themed exhibitions that we can all enjoy? If so, please drop us a comment or use the e-mail address provided below! Learn about Christmas via the History Channel’s online interactive exhibit, which details the history and traditions of the Christmas holiday. For even more links to some wonderful “Winter Holidays” websites, check out a great page from the Montgomery County (MD) Public Schools website. Besides Christmas and New Year, it includes Hanukkah/Chanukkah, Kwanzaa, and Winter Solstice links. Do you know of online Hanukkah/Chanukkah-themed or Kwanzaa-themed exhibitions that we can all enjoy? If so, please drop us a comment or use the e-mail address provided below! Regardless of religion and ethnicity, the winter months are such a time of celebration …. Many of you probably noticed that last week, December 7th, was the 69th anniversary of Pearl Harbor. To commemorate that infamous day and World War II, subscription web-site Footnote.com has made two databases from its collection FREE during the month of December. World War II Diaries, 1942-1945, submitted by most units in the Navy (most Marine Corps war diaries were submitted by aviation units such as fighter squadrons), provide a day-to-day record of operational and sometimes administrative activities. This database contains 251,082 document images. NARA's Access to Archival Databases has several databases regarding World War II army service, such as listings of prisoners of war (c. 1941-1946) and U.S. Army enlistment records (c. 1938-1946). Take this opportunity to research an ancestors’ World War II participation. As the final feature for 2010 and our holiday offering to members we are releasing at the website today Thomas W. Jones, phd, cg, cgl, fasg, fuga, fngs on “Becoming a Genealogist.” Listening to Tom is always rewarding, both instructive and entertaining. In this conversation he tells about the curiosity he felt as a child about who his ancestors were, reflects on how genealogists “get hooked,” and presents his view on the value to professionals of continuing their own personal research. While you are at the website take a moment to enjoy others you may not yet have seen. Log in at http://www.ngsgenealogy.org/, click on the Members Only tab, and then click on NGS Videos in the sidebar menu. It is a chance for you to make comments that will become part of a pemanent record. Genealogists, you love census records. I would easily nominate you as their No. 1 fan! 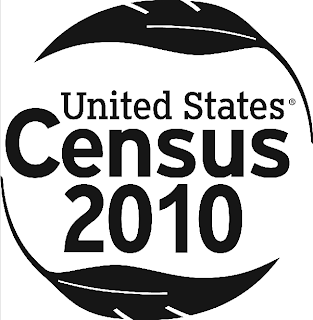 Census records are rock stars for those who love to research family history. Have you ever wondered what it will be like to research the 2010 Census records in the future? The decisions about what is permanently kept are being made today, and you can have your say. 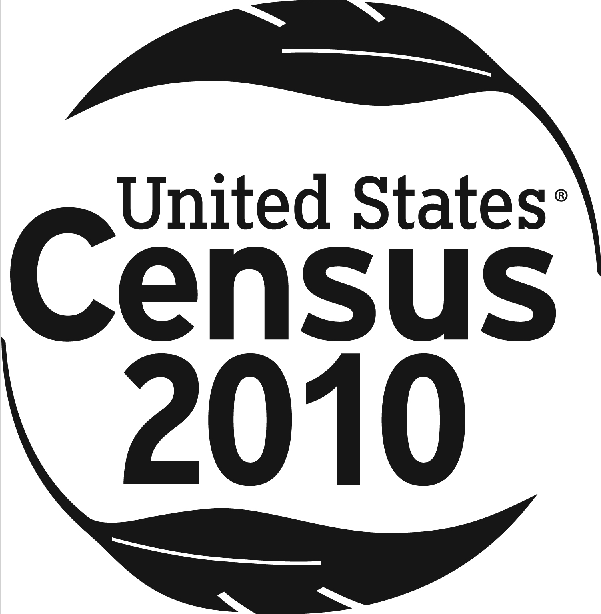 Right now, the appraisal and records schedule of the 2010 Census are available for public review and comment. There is a Records Express blog post and a notice in the Federal Register, but we also wanted to make sure those of you who follow NARAtions are aware of the opportunity to review and comment. Yes, together it’s over 40 pages, but if you’re a history and policy lover like me, I hope you’ll be up for the challenge of reviewing it! Comments are welcome at NARAtions or the Records Express Blog. You can also email [email protected] or by mail to: NARA (NWML), 8601 Adelphi Road, College Park, MD 20740-6001 by December 30, 2011. All comments will be made part of NARA’s official file on the records schedule and will be preserved as federal records. As more and more videos become available to NGS members on the NGS web-site, more videos become available via YouTube and elsewhere. For example, a video titled Helen Leary: How I Became a Genealogist is up and running on YouTube. 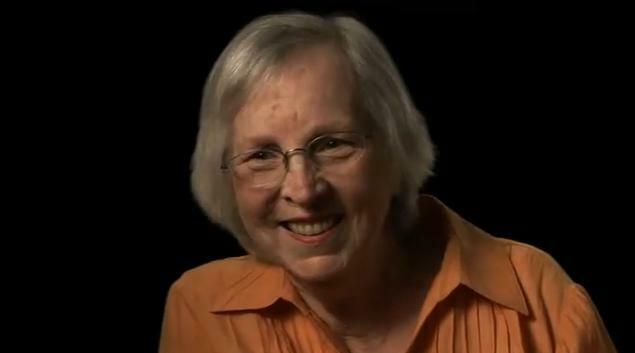 In this video, this preeminent family historian, Helen Leary, CG (Emeritus), FASG, FNGS, tells about her journey from art history studies to a life in genealogy -- by way of cash register tape and suit boxes! Film by Kate Geis and Allen Moore. New videos are regularly becoming available on the YouTube web-site and so do periodically check back. NGS will make announcements when there are new "members only" videos or videos available to the general public, regardless of which video platform. Have you ever checked out Roots Television? If not, a great reason to is to see the NGS video Paths to Your Past which is now available there. Also, the Leslie Anderson video, Connecting Youth to Family History, is showing on Roots Television. If you search further, you will find the NGS video titles The National Genealogical Society Home Study Course and Genealogy You Don't Have to Be a Celeb to Trace Your Roots. These short videos are fun, informative and inspiring.